TO LIFE! TO LIFE!! L'CHAYIM!!! The skins must be processed lishma [for the sake of Heaven] this means that when you put them into the lime, which is the beginning the processing, you say "these skins I am processing for the sake of Sefer Torah & that is why I am putting them into the lime" & them you put them immediately into the lime. The lime creates an altered ph balance - kills bacteria, reduces the acid, loosens the hairs, makes a very alkaline environment. In Talmudic times they used a solution which was made acidic by dog dung. That's why the wife of a tanner could be granted a get & have her ketubah paid to her, if she couldn't stand his reek. Tanneries were located out of town & downwind in those times. Question that came up in my telephone chevruta: Doesn't fleshing deserve to be considered as part of the process? Shouldn't the membrane & fat & flesh that you have to scrape away at the beginning of the tanning process be done lishma? Is this not the beginning of raising these holy sparks? Why not state "Hineyeni ani me'aberet et ha-or ha-zeh le-sheym kedushat Sefer Torah"? & since the beginning of the processing is lishma, then also the work that comes after like smoothing, flattening/stretching them [the skins] & scraping/sanding them - all of them after the beginning of the processing are dragged along with it, [ie they follow that initial statement of intent & they don't necessarily require their own statement of intention]. In any case it's right that with all of there acts subsequent that you say that you're performing them lishma at the beginning when you put the skins in the water so they'll be kosher for processing you also say that you're putting them in lishma, so it's proper that you speak your intent over each step of the way, bidieyved [after the fact] as long as you did it at the very beginning then that's still acceptable. But if you didn't put in the lime lishma & even if all the rest of the processing was done lishma, it's not mutar - it's not permitted. You can't use them for this work. This is a lovely link about gevil, which is not qlaf (parchment), but another kind of processed skin that some rule is the only kosher way to go. Click on the links there, too - it's really cool! & the wallpaper is really pretty, too! 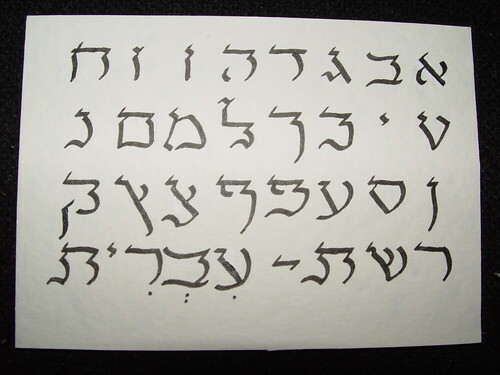 For a pic of a large childbirth amulet I wrote on qlaf, look here. To see me holding up a blank yeri'ah, a sheet, of Sefer Torah qlaf to a glass brick window, go here. & click here for an image of lamplight streaming through blank Megilat Esther parchment. Have a gorgeous Shabbes Qodesh! Technorati tags: religion, Judaism, Torah, Canada, journal, weblog, blog, diary, Flickr, Technorati, Art. posted by Soferet | 1:48:00 a.m.
Do you know anything about using parchment for bound codices? The small amount of bookbinding I have done has not involved parchment, however I happen to be dear friends with Yehuda Miklaf, the foremost bookbinder in Israel. He is stunningly talented, & I'm sure he wouldn't mind chatting with you about parchment in codices, since that's one of the things he does & he's a friendly sort. I've been meaning to ask you -- since I think I saw this on your site. Did I read right that the meat of the animals whose skin is used for sacred parchment cannot be eaten? The meat of the animals could be eaten if they were schechted/kosher slaughtered. You're referring to this post, right? Traditionally, we have to use kosher animals to make sofrut items, but they don't have to be schechted. So if they aren't schechted we can't eat them. If they were schechted, no problem. I don't know about "the good old days", the meat probably went to feed dogs & the like...but nowadays, because of the huge global beef industry (which is evil), any schecht that turned out to not be kosher (because maybe the organs were too scarred), the meat is sold to regular treyf slaughterhouses for the population at large to consume. I was disappointed when I first found this out, because I prefer to be conscious of the life-memory each animals parts bring along with it. Who would want to wear tefilin made out of an animal who went through an abbatoir, dying in fear & pain? But if you get to know the right people, you can sometimes trace the source all the way back.